Annie Finch's books of poetry include Calendars (a National Poetry Series finalist), Eve, Home-Birth, The Encyclopedia of Scotland, Season Poems, Catching the Mermother, the epic poem Marie Moving, and a book of translations of the French Renaissance poet Louise Labé. Her book on poetics, The Ghost of Meter, has been reissued in paperback, and her anthology A Formal Feeling Comes: Poems in Form by Contemporary Women is in its fifth printing. She is coeditor of An Exaltation of Forms: Contemporary Poets Celebrate the Diversity of Their Art, and her poems and translations have been published in the Norton Anthology of World Poetry, the Penguin Book of the Sonnet, The Kenyon Review, Poetry, Prairie Schooner, Field, The Paris Review, Agni Review, Thirteenth Moon, Partisan Review, and elsewhere. She currently directs the Stonecoast Masters of Fine Arts program in creative writing at the University of Southern Maine. A sunny afternoon, think of Vermeer. there is for pitchers here this afternoon. then other days than this afternoon’s years. 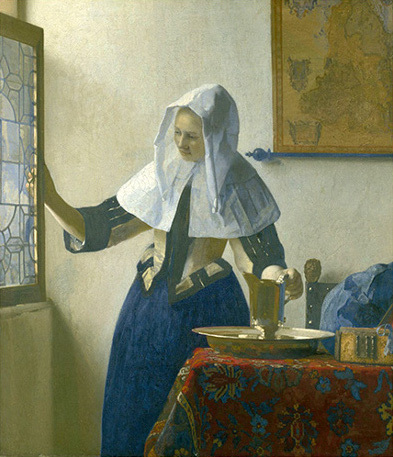 and drop the pitcher, and betray Vermeer. interlocking rings in the chain of wrist and arm." "Lie for me, lie, and I will feel you turn. to cradle the concrete ground to softness. Stay. Close yourself over; encompass me like clay." Ring, ring, ring, ring! Hammers fall. linger on tongues, burn away. noticeless, stilling her undertow in waves. she gathers to green, listening, shaman and human. into this cold dry well. and feed the cracks of the world. you've all our lives to praise the rest. then my heart cries, in a secret passion of her own. so that my love can softly enflame your heart? a fine day comes, and they're clothed again in light. now it's colder than my own could ever be. Already, she's kissed her cold Antony on his dead lips. Already, she's kneeled down in front of Augustus and cried. sound under the Eagle of Rome, and the darkness spreads wide. Her throat, like the neck of a swan, holds its tranquil sway. it close to her rich breast at last, with a casual hand.